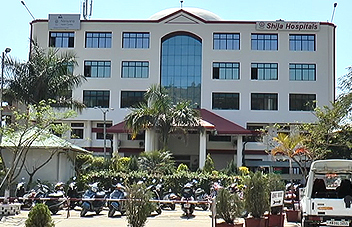 Shija strictly follows the system of segregation of bio-medical waste at source and ultimately appropriate treatment and disposal of waste through incinerator, shredder, sharps pit, deep burial etc for the safety of environment. . Shija Bio-Medical Waste Management is now recognised by the Manipur Pollution Control Board as the common facility for the entire state. Considering today’s changing environment condition / degradation & its ill effect that may cause severe damage to human & its environment, Shija installed necessary treatment & disposal equipments such as incinerator, autoclave, shredder etc. and installed onsite in the hospital premises. The bio-medical waste so generated are treated & dispose according to characteristics of the wastes, according to the rules given in the Bio-medical Waste (Management & Handling) Rules, 1998. In 1996, Shija installed an electrically operated incinerator for the first time in the state of Manipur. Capacity of the Incinerator is 5Kg/hr. In the year 2008, a diesel operated Incinerator of 25 Kg/hr was installed to meet the requirements of the Bio-medical Waste (Management & Handling) Rules, 1998. The Manipur Pollution Control Board, authorized the set up for bio-medical treatment as Common Bio-medical Waste Treatment Facility (CBWTF) where all bio-medical wastes generated from healthcare units operating in the State of Manipur, shall be collected for treatment and dispose, to reduce adverse effects that this waste may pose or may finally sent for disposal to landfill or for recycling purposes. Today, the stakeholders are implementing the Bio-medical Waste (Management & Handling) Rules, 1998 in their units in proper way. The Shija CBWTF is catering up to 1500 beds out of 4856 bed strengths. There are 9(nine) districts in Manipur state. Out of which CBWTF of Shija is catering in 3 districts( Imphal East, Imphal West and Bishnupur District).